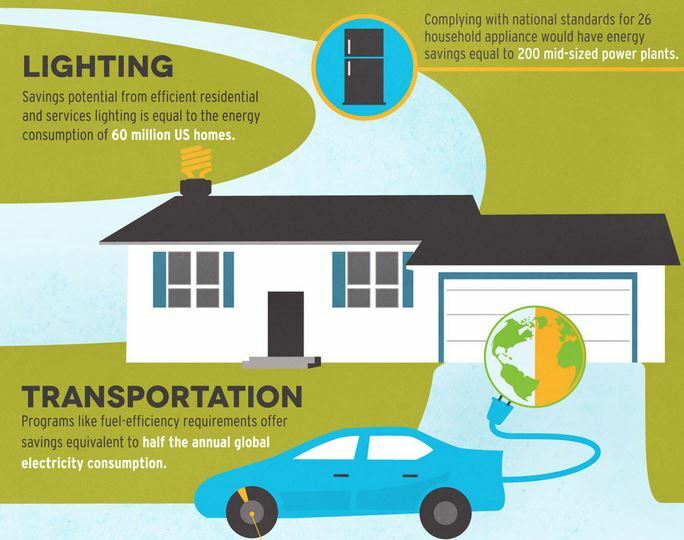 Energy efficiency—getting more from our existing resources— increases global resource productivity, supports economic growth, and reduces costs for all citizens. Investing in energy efficiency creates jobs, fosters economic growth and improves energy security for countries that lack domestic fossil fuel resources. Of the three objectives of Sustainable Energy for All, improving energy efficiency has the clearest impact on saving money, improving business results, and delivering more services for consumers—better refrigerators that cost the same but use less energy; new vehicle designs that travel further on less fuel; and buildings that require less energy to heat and cool. 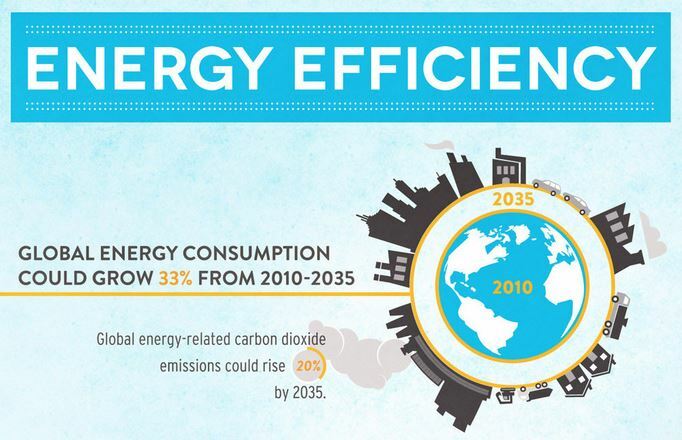 Investing in efficiency is critical to meeting future energy demand and mitigating climate change. It reduces greenhouse gas emissions and improves productivity. By reducing energy demand, efficiency also makes renewable energy more affordable – shrinking the size of the solar panel needed to power a lamp, for example. Moving to sustainable energy and using it efficiently makes sense in a resource constrained global economy. Energy is the golden thread that connects economic growth, increased social equity, and an environment that allows the world to thrive. Many countries are already adopting efficient energy technologies and practices. In Africa, the savings from energy efficiency could help make modern energy services available to those who lack it—and in more industrialized countries, investments in energy productivity can create new jobs, foster economic growth, and reduce energy costs for families and businesses. Adopting cost-effective standards for a wider range of technologies could, by 2030, reduce global projected electricity consumption by buildings and industry by 14%, avoiding roughly 1,300 mid-size power plants.Between 1990 and 2006, increased energy efficiency in the manufacturing sectors of 21 member countries of the International Energy Agency resulted in a 21% reduction of energy use per unit of output. Sharing and adopting these practices more widely among nations and industrial sectors can make energy more reliable and less expensive to homes and businesses. 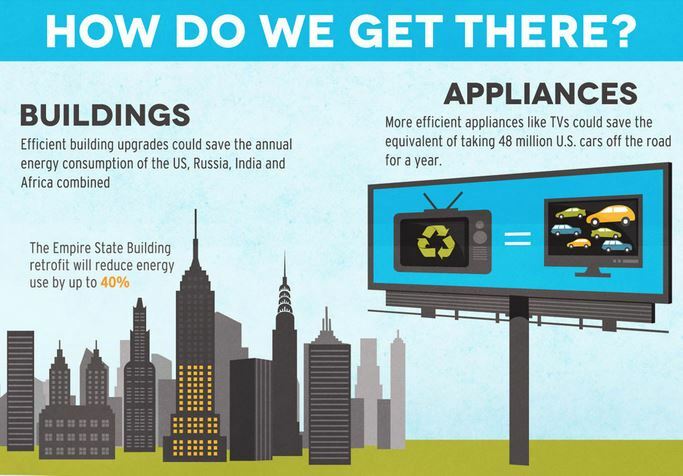 Now is the perfect time to double the rate of improvements in energy efficiency. Equipment maintenance, thermostat settings, and upgrades can reduce emissions up to 50%. Invest in energy efficiency options that generate in excess of an average rate of return of 17% or higher.